If you’d like to dip your toe into the world of blackjack then it’s worth taking a few minutes to familiarise yourself with the rules of the game before hitting the casinos. In this article we have provided the rules of standard blackjack although there may be variations from one casino to another. 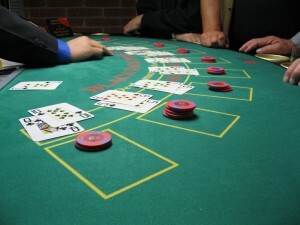 Blackjack is played with a number of card decks ranging from one to eight; the more decks there are, the harder it is for card counters to ply their trade. Fifty two card decks are used with no jokers. The aim of the game is to achieve a hand with a points total of no more than 21 but also better than the banker’s hand. You are only playing against the banker, not the other players involved. The cards in blackjack are worth their face value – J, Q, K are worth 10 – while the A is worth 1 or 11, whichever suits the player best. The first thing to do is place a bet according to the house rules in the circle provided on the table in front of you. The dealer distributes two cards to each player face up; the dealer has one card face up and one face down. At this point any players holding a blackjack (an A and a 10-point card) win their bet unless the dealer is also holding a blackjack – in this case it’s a ‘push’ and your bet is returned to you. Split – this option is available if the first two cards have the same value. The player can choose to split and play with two hands rather than one. When each player has made their choice it’s the dealer’s turn to reveal that face down card. The dealer has no choice in how to play his hand and cannot stand on anything less than 17. When the dealer’s hand has reached at least 17 all hands will compare against this one; if the dealer has bust (gone over 21) all players left in the game win. Players with a higher total than the dealer will win but those with a lower or equal total will lose. An option in some casinos and electronic games, the player can pay extra for insurance if the dealer’s face up card is an A. Insurance is equal to the player’s wager and will pay at 2/1 if the dealer ands a blackjack, effectively cancelling out your bet.